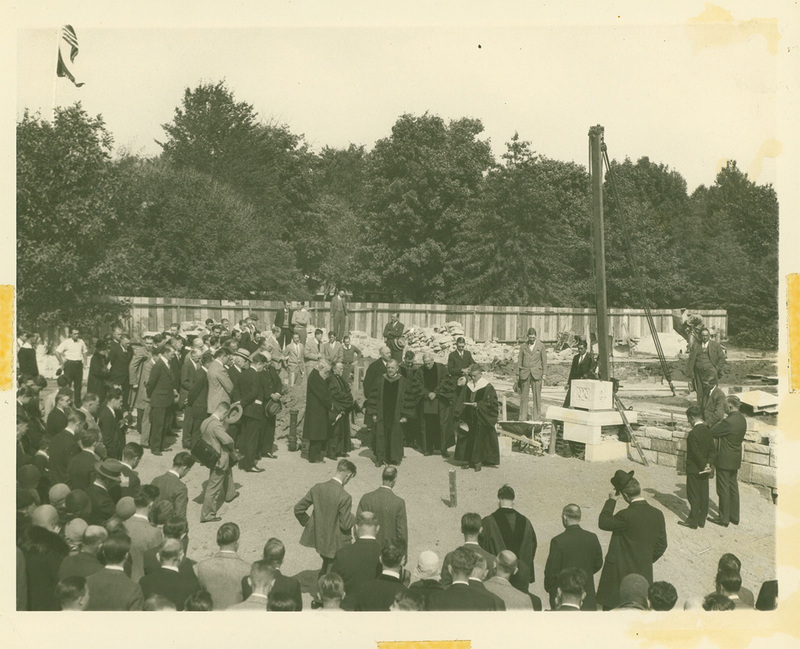 The donor who made Muhlenberg’s long-awaited chapel a reality was Annie Egner Hartzell, daughter of Gideon F. and Sara A. Shimer Egner and wife of George W. Hartzell, Jr. Gideon F. Egner (1843-1912) was a Civil War veteran, prominent local businessman, and devout Lutheran, and in her will Mrs. Hartzell specified that a granite chapel on Muhlenberg’s grounds would be a fitting memorial to her parents. Her donation of $125,000 made this aspect of “A Greater Muhlenberg” suddenly attainable. The balance of the over $400,000 required to complete the building was donated by students, alumni, and affiliates of the College. Their names can be seen inscribed throughout the Chapel. 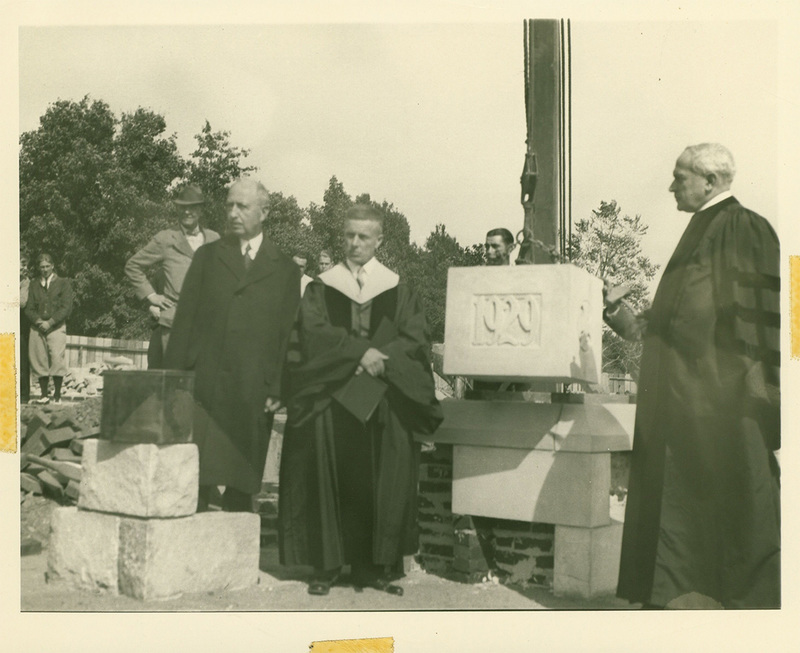 The Chapel cornerstone was laid on October 12, 1929. The building is constructed of Plymouth granite masonry trimmed on the exterior with Indiana limestone and on the interior with precast stone. The on-site representatives responsible for the construction were long-time Muhlenberg architects Ruhe and Lange of Allentown. The woodwork is all in oak, and the furniture was crafted by DeLong Furniture Company of Philadelphia. 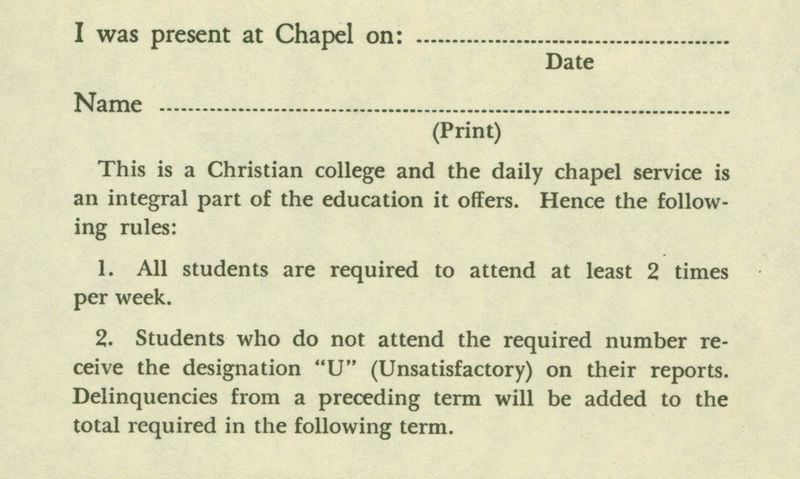 The plan for the ornament and symbolism of the Chapel was the work of Rev. Luther D. Reed, President of the Lutheran Theological Seminary in Philadelphia. 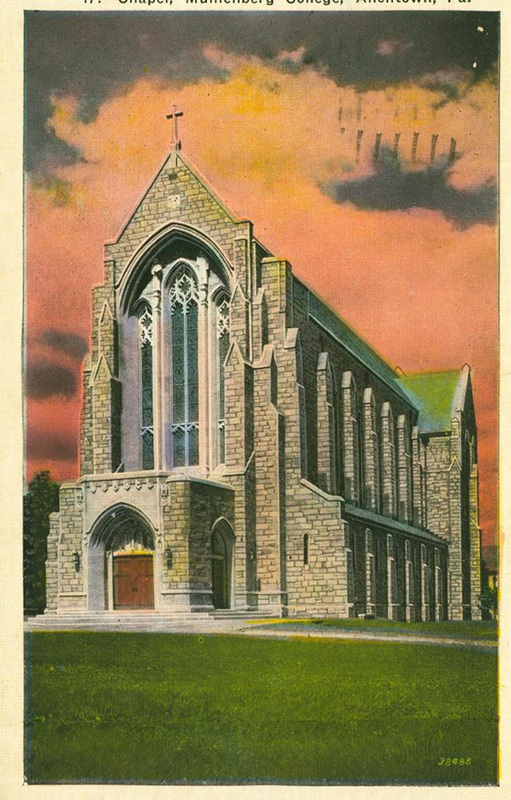 D’Ascenzo Studios of Philadelphia was responsible for the Chapel’s stained glass windows, although they were not fully completed until after World War II. Material shortages made window manufacturing prohibitively expensive or impossible. Photographs of the Chapel’s stained glass are available here. The original organ, manufactured by the E. M. Skinner Organ Company, was the gift of Muhlenberg’s Women’s Auxiliary in honor of Mrs. George K. Mosser, president of the 850-member organization, in gratitude for her many years of service. The inaugural recital of the Mosser Memorial Organ was held on May 28, 1931, performed by Henry F. Seibert, organist of Holy Trinity Church in New York. By the 1960s, the organ had fallen into disrepair, and it was long the hope that a repair or replacement could be found. 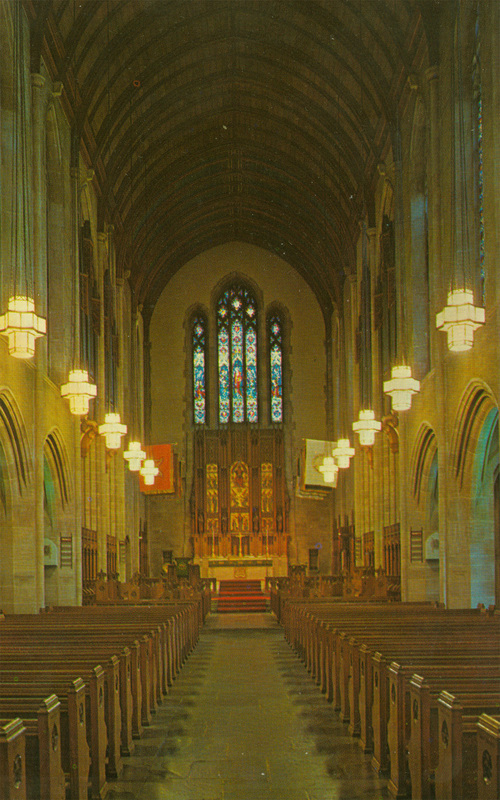 In 1983, thanks to a private donor, a new, larger organ was installed, designed by the Holtkamp Organ Company. 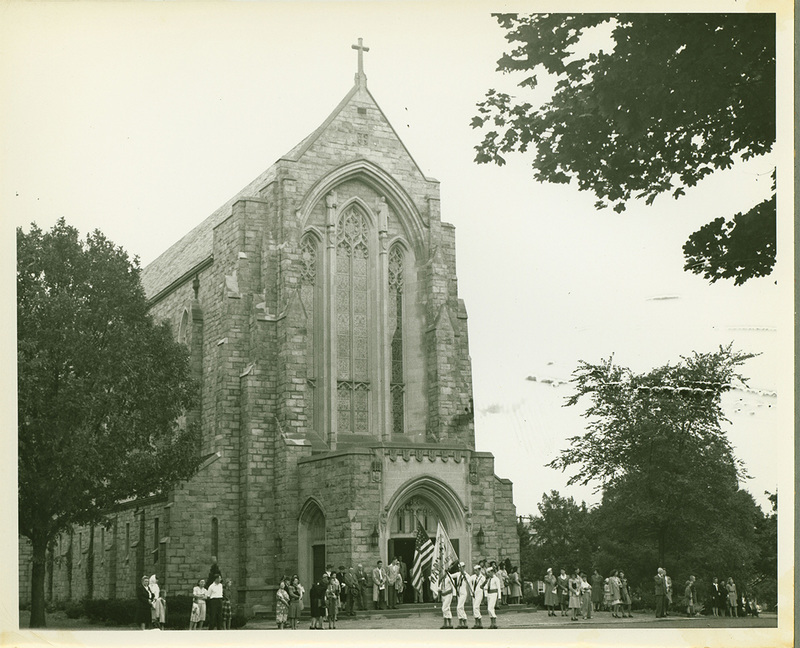 The Gideon F. Egner Memorial Chapel was dedicated as part of Commencement exercises on June 1, 1931. The Chapel is open to the public unless specific events are underway; feel free to explore this magnificent structure for yourself. 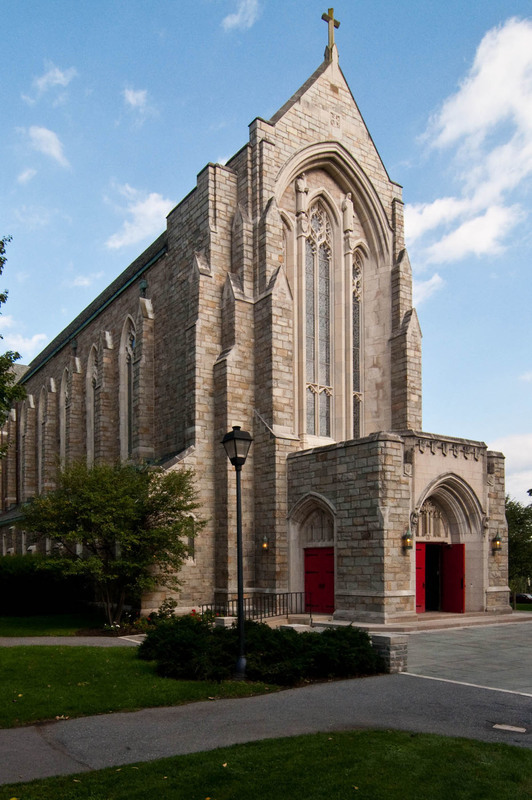 For more information about the Chapel, we invite you to browse “Muhlenberg’s Living Stones” by Michael Salvatore Tripaldi ‘03, which is available in Trexler Library as well as in the pews of the Chapel. 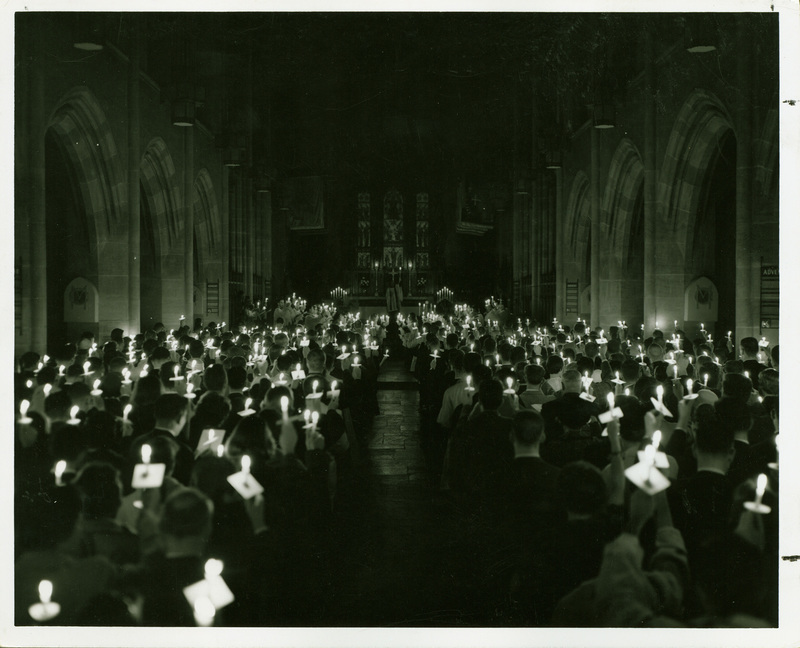 Special Collections and Archives, Trexler Library, Muhlenberg College, “Gideon F. Egner Memorial Chapel (1931),” Muhlenberg Pathways to Present, accessed April 23, 2019, http://pathways.trexlerworks.muhlenberg.edu/items/show/18.